Guided walks in Jersey. Dates of our walks on the seabed to the end of August are now listed here. Guided walks to Seymour Tower & Bioluminescence walks during the holidays.Dates and times. Night-time Moonwalk to Seymour Tower. 2245 on Saturday 15 March. Call 07797853033 to book. Anthony Toole writes about his walk on the seabed to Seymour tower for BucketTripper. 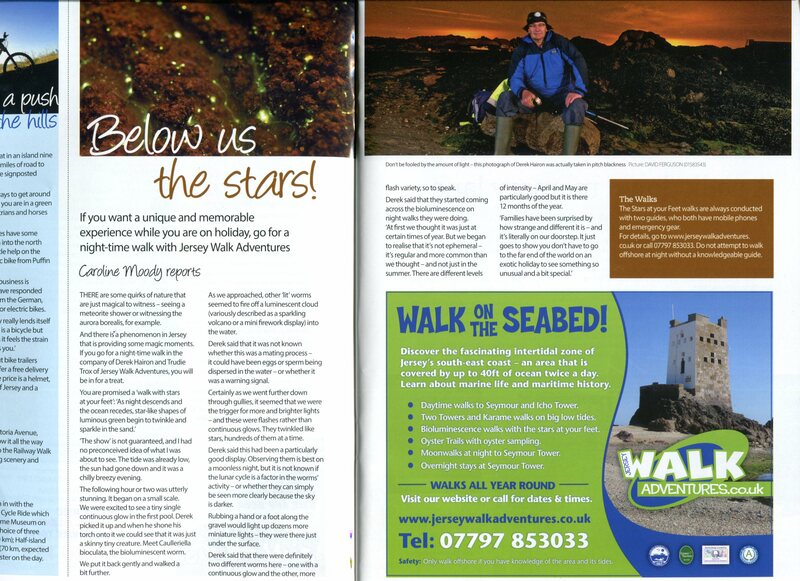 Our evening guided walks on the seabed (Moonwalks) in Jersey feature in the latest edition of Absolute Jersey. This short article captures the fantastic experience of discovering tiny glowing worms (Caulleriella bioculata and sometimes Anaitides maculata) which inhabit a few special spots around the coast of Jersey. As we walk between the rocks which appear as the tide recedes we encounter these small worms. This really is like walking with the stars at your feet. Above us the stars and constellations can also be seen. On a still night both the glow of the worms and reflections of the stars create a magical experience. Dates are listed on our Walking in Jersey Diary of walks. They take place all year round when the tides are low enough. Private walks on other dates can sometimes be arranged. In 2017 we featured in The Guardian travel pages with a feature and some stunning photos of our bioluminescence walks. Bioluminescence walk dates are listed via the Book Now button. 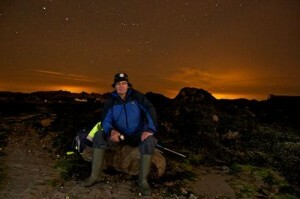 Bioluminescence walks this weekend: Saturday 6 2200 & Sunday 7 April at 2230. Call 07797853033 to book. Lots of walks on the seabed this Easter on some big low tides. Join us on a guided “Moonwalk”. Day, Evening, Night walks and The Oyster Trail.